8Dio Hybrid Tools Series is the leading industry standard for Epic Cinematic Scoring Tools. 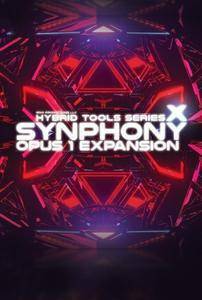 Opus 1 is our first expansion pack to Hybrid Tools Synphony and be used either stand-alone or together with Synphony. Hybrid Tools Opus 1 contains a variety of exclusive features that you won’t find anywhere else, including our new Chaos FX 3.3 Engine, which contains over 100.000 lines of code and includes our CHAOS engine with the ability to randomize, reverse, mix/blend anything you want and manipulated over 1.500 parameters with a single click. Opus 1 contains a fully rendered 3D User Interface with a variety of new controls, including Tempo-Synced Gate, Reverse, Randomizer, Speed Control, Pitch Envelope, Glide and Offset – all accessible from the front-interface. You can also go deeper into our Chaos FX and control everything from Filters, Step-Based Filtering, 3 EQ, Stereo Delay, Bit Crusher, Distortion, Dual-Convolution reverb with convolution FX. Opus 1 contains a variety of new sound categories, including Mega-Horns, Sirens, Risers, Analogue Noises, Tonal Whooshes Short, Tonal Whooses Medium 1 and 2, Tonal Whooshes Long. In addition it contains 20 Analogue Noise Kits, 30 Cinematic Basses, 10 Synthesized Pianos and 10 Synthesized Spiccato Strings. It also includes an assortment of presets. Hybrid Tools Opus is the first extension to Hybrid Tools Synphony. The library can either be used stand-alone or together with Synphony. Opus 1 contains over 19GB (compressed to 9.8GB) of new Hybrid Content. Whether you want the newest industry defining Hybrid Effects (ex. New Mega-Horns, Sirens, Analog Noises, Tonal Whooshes etc.) or Noise Based Drum Kits, Massive Cinematic Basses, Synthesized Pianos and Synth-based Spiccato Strings. Hybrid Tools Opus 1 contains a 3D mini-browser that allows you to access all sounds immediately. All core banks come preloaded in the internal browser, so you can audition dozens of patches without load-time. You can combine as many patches you want using our STACK key – and you can REVERSE, RANDOMIZE and CHAOS anything with a single click from the front-interface. Everything is right at your finger tips, so you can get back to making music. Hybrid Tools Opus 1 controls a powerful arpeggiator allowing you to virtually arpeggiate anything you want. You can control the velocity, steps, swing, rate, repetition, steps and many other elements in the arpeggiation, while also manipulating features such as attack, release, pitch-envolope, randomization, reverse, chaos and many other elements in real-time. Hybrid Tools Opus 1 contains a full-fledged drum-sequencer, which allows you to push our new 20 cinematic noise-kits to the absolutely maximum. The drum sequencer contains up to 4 different patterns that can be controlled in real-time and all knots-bolts you would expect from a drum-sequencer. In addition you use our STACK function and combine as many kits you want and manipulate the sounds instantly from our front-panel. Our new 3.3 FX CHAOS Engine allows you to STACK, RANDOMIZE, REVERSE and CHAOS any or ALL patches with a single click. It is one of the most extreme feature in Hybrid Tools Synphony. The 3.3 FX CHAOS Engine allows you make over 1.500 sample parameters randomize with one click, while also randomizing our new 8Dio FX System. So both the sample content and the assigned FX will be randomized in one glorious cocktail – all with one click.